The beginning of the story of Cheonjiwang Bonpuri, depicted in five panels. The myth starts with the creation of the world, when the sky and the earth were one. As there were no sky nor earth, as a result, there was only an empty void. However, one day, a gap formed in the void. All that was lighter than the gap headed upwards and formed the sky. All that was heavier than the gap fell down to become the earth. From the sky fell a clear blue drop of dew, and from the earth rose a dark black drop of dew. As these two drops mixed, all that existed, except the sun, moon, and the stars, came to be. As the beginning of the story has no characters, none are depicted. The piece was an attempt at conveying the story with no characters and no dialogue. Figuring out how to convey the earth and sky separating without telling it directly was one of the most difficult parts, the sky in particular– I struggled with painting the sky without the clouds. I feel the separation action was decently clear, but the dewdrops mixing is not. One has to be very close to the painting to tell what the drops are, and the panel where they mix is unclear; it just looks like a swirl. Had I had more time, I would have repainted the fourth panel to make it clearer. 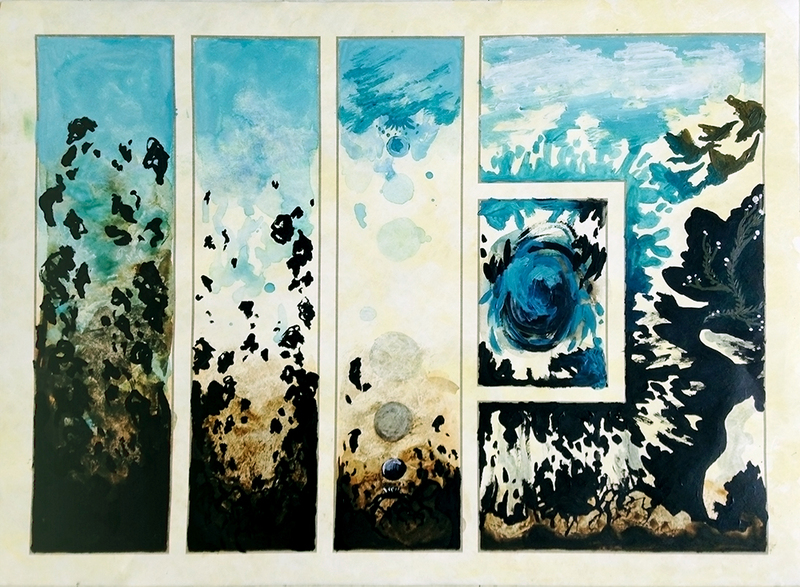 This entry was posted in Non Time-Based and tagged 18"x24", Acrylic, Creation Story Comic, Figure and Motion, Watercolor. Bookmark the permalink.